Emily Austin isn’t the type of philosopher that her mother feared she might become – one who wears all-black outfits and smokes clove cigarettes. Along with the collection of philosophy books on display in her office, Austin has a Calvin and Hobbes comic strip posted on her door and a stuffed Socrates doll sitting on her desk. Sure, the Associate Professor of Philosophy has focused much of her research at Wake Forest University on the negative emotions surrounding death. But Austin can also crack a joke, make a great mixtape, and offer an opinion on the best Memphis barbecue. 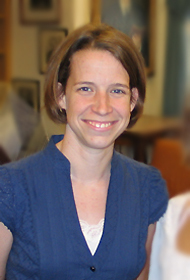 As soon as Austin arrived on WFU’s campus in Fall 2009, she began teaching Contemporary Moral Problems, which other professors have steered clear of because its discussions about such issues as abortion, euthanasia, and war have the potential to get heated. As a kid born and raised in Little Rock, Ark., Austin aspired to someday become a judge. By the time she attended Hendrix she wanted to teach history. Everything changed, however, when Austin took a class called Present Moral Problems, taught by Peg Falls-Corbitt, Professor of Philosophy at Hendrix. Many of Austin’s long-held beliefs were challenged in the classroom. In the same way that Austin used to poke her head into Falls-Corbitt’s office to chat, Austin’s students are doing the same to her. She’s also helping to create a new generation of philosophers. Austin has lately shifted her research to individual and political happiness (eudaimonia), in particular as it’s expressed in one of Plato’s more bizarre, neglected, and funny dialogues called the Euthydemus. In the dialogue, written around 380 BCE, Socrates considers such questions as whether a person can be both rich and happy (he says no) and whether anything is unquestionably beautiful (he says absolutely yes). Austin has written a series of articles about the Euthydemus with the hopes of turning them into a book. Falls-Corbitt has also invited her to return to Hendrix in April to speak to a class and talk at the 40th anniversary of the college’s Steel Center for the Study of Religion and Philosophy. However, Falls-Corbitt remembered Austin being a lot more serious in college than she is now.